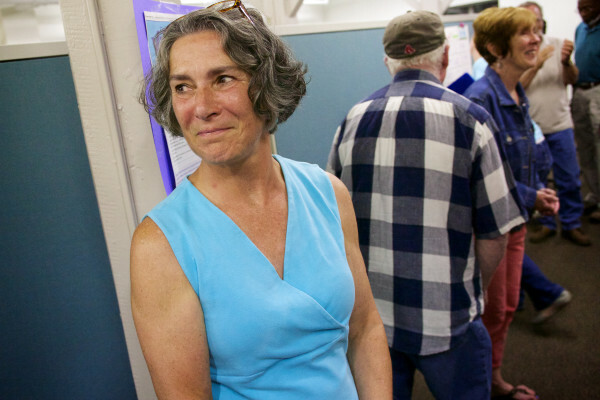 TOPSHAM, Maine — Republican Linda Baker scored an approximately 1,000-vote lead over the incumbent Tuesday in a race for Maine Senate District 23. Baker, of Topsham, had 7,979 votes, compared with 7,509 from Sen. Eloise Vitelli, D-Arrowsic, and 2,004 from Green Independent candidate Alice Knapp, of Richmond. The new state Senate District 23, which includes all of Sagadahoc County and the Lincoln County town of Dresden. Vitelli dominated in Bath with 2,096 votes, compared with 1,319 for Baker and 317 for Knapp. Baker took her hometown of Topsham with 2,780 votes, compared with 1,789 for Vitelli and 334 for Knapp. Baker taught in Bath from 1980-1985, and at Mt. Ararat High School from 1985-2011. Baker now teaches at Merrymeeting Adult Education. She served on the Topsham Board of Selectmen for three years in the 1980s, and spent five years on the Blaine House Scholarship Selection Committee, and 10 on the Jobs for Maine Graduates Advisory Board. Vitelli was elected in Senate District 19 last year in a special election to replace former Sen. Seth Goodall, D-Richmond. She is director of program and policy at Women, Work and Community, serves on the Maine Economic Growth Council, and was president of the Midcoast Economic Development District. Knapp has had her own law firm in Richmond since 2002, and has been practicing law in Maine since 1989.